Providing fresh water for your pet is the responsibility of all pet owners. The Drinkwell Pet Fountain can help do that quite easily and keeps the water fresh constantly. What Is the Drinkwell Pet Fountain? The Drinkwell Pet Fountain is a water fountain that provides a fresh stream of water for your pet from a free-falling stream of water. It holds 50 ounces of water, with the capability of adding a reservoir that can add an additional 50 or 70 ounces of water. This pet fountain runs on electricity and features a charcoal filter that removes bad tastes and odors so the water is always attractive to your pet. In the interest of full disclosure, I was provided with the Drinkwell Pet Fountain in consideration for writing a review. However, after using the fountain, I find myself more than happy to provide a positive review. The Drinkwell Pet Fountain arrived almost fully assembled. All I needed to do was insert the charcoal filter, which was a simple operation. It simply slides into place inside the water reservoir. It took only moments to get the fountain up and running. Basically, all that was required was inserting the filter, filling the unit with water and plugging it in. My cats love the free-falling stream and Rusty and Midge actually prefer to drink out of the stream rather than the bowl. The others seem to prefer the bowl. The water remains clean and clear, even when Rusty sticks his foot in the bowl and splashes the water around. I have used other water fountains that do not keep the water as clean, so this is a benefit I like. I do have to refill the unit with water on a daily basis, basically just topping it off so that it is full again. I am not using either of the optional reservoirs that hold additional water but this may be an option for pet owners who need to provide additional water. I also have six cats that are using the fountain and your mileage may vary with fewer animals. The fountain does make a fair bit of noise when the water level is low but runs quietly when the water level is higher, although there is a small hum from the motor and the sound of running water from the fountain. I find the sound of the water-fall soothing but some might find it objectionable, especially in a bedroom. Who Can Benefit from the Drinkwell Pet Fountain? Anyone who prefers to provide a fresh supply of drinking water for their pet with a free-flowing stream of water can use the Drinkwell Pet Fountain to provide that benefit. 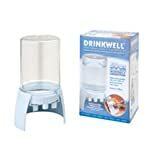 The Drinkwell® Cleaning Kit provides product owners with a convenient and easy solution to keep their fountain clean! Now with new, improved, features such as a plastic molded handle, a flared sponge tip for deep cleaning and vinyl wraps to protect the wire shaft from rust. The Cleaning Kit works with all fountains! The Drinkwell® Platinum Filters feature six compartments of charcoal! This evenly distributes the charcoal for a longer lasting, deeper water filtration. More charcoal is added to each compartment to maximize water filtration. This filter will work with ANY Drinkwell® Fountain (except the Drinkwell® 360) and should be changed every 2-4 weeks to maintain water freshness. There are three filters per package. Drinkwell® The Original Pet Fountain is perfect for single-pet households! It features the Drinkwell®-patented free-falling stream of water and a large charcoal filter to remove bad tastes and odors, giving your pet the best possible and most appealing way to stay hydrated. The Original Pet Fountain not only satisfies a pet’s preference for running water and need for proper hydration, but is also convenient for owners. The easily-maintained fountain has a 50 oz. capacity and can hold up to 120 oz. of water (with the use of an optional reservoir). Best of all- the Drinkwell® Pet Fountain keeps pets off of counters and out of sinks and toilets! 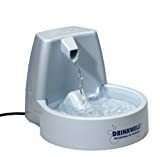 Drinkwell fountains are compatible with all US 110v outlets only and are not to be used with 220v international voltage. 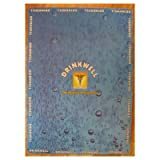 Drinkwell® filters offer an extra large charcoal filter and duo density pads remove bad tastes and odors making the water more appealing to drink. Filters are available in a 3-pack and should be changed every 2 to 4 weeks for maximum water freshness. The original filter features two compartments of charcoal and is compatible with all fountains EXCEPT the Drinkwell® 360. The Drinkwell® 360 Pet Fountain can provide up to five, patented free falling water streams for multiple pet owning households. The Drinkwell® 360 was designed with the multiple pet household in mind, giving owners the ability to customize their fountain with the five interchangeable spout rings included with each fountain. Pets no longer have to wait their turn for a quick lap of water; they now can each have their own fresh flowing stream of water from any angle. Utilizing the same filtration technology as the other Drinkwell® Fountains, the Drinkwell® 360 constantly circulates the water which inhibits bacteria growth, keeping the water tasting fresh and appealing to pets! Drinkwell fountains are compatible with all US 110v outlets only and are not to be used with 220v international voltage. The Drinkwell® Big-Dog Fountain was designed by a veterinarian specifically for large dogs. The Drinkwell® Big-Dog holds well over two gallons of water, making it the largest capacity pet fountain on the market (288 oz.)! Ideal for large dogs and multiple-pet homes, the Big Dog uses the same innovative watering system as the Original Pet Fountain, featuring the patented free-falling stream of water that consumers have come to rely on for cats and small dogs for the past decade. A large charcoal filter removes bad tastes and odors leaving your pet with fresh-tasting, filtered water. The Drinkwell® Big-Dog is the best and most convenient way to provide man’s best friend with fresh filtered water for days at a time. Drinkwell fountains are compatible with all US 110v outlets only and are not to be used with 220v international voltage. The Drinkwell® Pet Fountain Floor Mat protects all type of floors from splashes and spills from filling our your pet’s use of the fountain. It is particularly useful on wood floors in climates where condensation under the fountain is an issue raising the potential for finish or warping damage. The mat comes in two sizes which are perfect for the Original, Big Dog, and Platinum Fountains. Each mat features a soft skid-free rubberized bottom. It’s foam construction also provides a soft base that stops any rattling noise that can occur on uneven floors beneath. The top of the mat is completely waterproof, and will not absorb any water into the foam below, so you can be confident that no moisture will accumulate protecting from mold/mildew formation as well. It also makes wiping up the mat a breeze, as well as making it stain-resistant. Designed for use with the Original and Platinum Fountains. Not compatible with Big Dog Fountain. 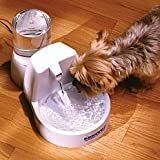 Find more Drinkwell Pet Fountain products on Amazon!